Zozan Abrams (real name Susan Abraham) wrote a commentary on of my book, Nights of the Dark Moon. I call it a commentary because she said it was not a review. But it is intriguing and gives a different perspective of the book. 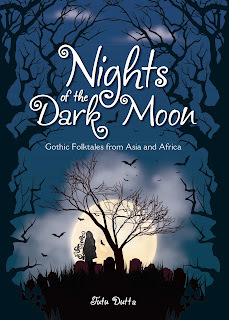 ‘I ferried Malaysian writer, Tutu Dutta’s newest storybook called Nights of the Dark Moon, published by Marshall Cavendish Editions in Singapore, to Dublin, a few days ago. It will prove an enthralling addition to my library. It is a beautiful looking book comprising 13 gothic Asian folktales. These also include two from Africa. I feel like a child again.. ready to cherish the glossy cover, thick cream pages & illuminating b/w sketches that enfold the start of every tale. These are from Dutta’s own talented hand. At just RM49.90 (Malaysian Ringgit), Nights of the Dark Moon is no less, a great gift for an older child. After having read it all, I would term the collection as grim fairy- tales; some even signifying high mystery and adventure. All stay riveting, captivating and gripping in their context. Each tale offers stimulating wisdom for a lifetime. Tutu Dutta narrates her stories with an engaging vocabulary, a great lov e for thoughtful storytelling and also, with painstaking affection. Just think of the few ugly demons that pop up as more of witches & wizards bent on their missions of hell. My favourite stays the first one, The Haunted Bridge of Agi. Possibly because, an older Malay friend with great knowledge of Malay culture, told me two years ago, about a true and eerie ghost tale… this very kind of bridge is said to exist somewhere in Perak state of the Malaysian Peninsula. There are said to be night ghosts on the bridge and the only ones that they will not harm – that are allowed to make a return crossing safely – are those holding a royal Perakian bloodline. Otherwise, you will be faced with a devil in front of you at some point, and your wily, frightening escape, will then depend on how bravely you handle the shock. Although the tales in the book are ancient Asian folklore in retrospect but they appear to hold a distinct European flavour in parts, especially with the dramatic but tragic love story gone wrong in India’s The Weeping Lady. It was so romantic, I even forgot it was a ghost story and supposed to raise the hairs on my neck. Then, I found another Indian tale, King Vikram and Betaal the Vampire to be truly ticklish. I mean, when you think about it, these days, we live in such an evil world that even the Vampire here, appears a real gem. It knows how to hold a civil dialogue with an irate King and unlike many today, practices its own serious moral code of ethics and integrity. The stories although nicely arranged, proved a rather tame read but then, that is understandable as I am now an older adult and have already devoured hundreds and hundreds of similar tales like these, as a child. It would be a natural effect. Hang Nadim – the legend of old Singapore’s swordfish battles, was narrated to me in the classroom at nine; by our Primary School teacher, who loved oral storytelling. She was called Cikgu Norsiah. When I first heard it, I was held enraptured to my little, wooden chair in Standard 3. I also know of the Yoruba tale, The Curse of the Iroko Tree, that originated possibly from Ibadan. I don’t know if I had read this from some African literature in my library or picked up the tale of a child found in a tree and had to be returned to it as an adult, from some Yoruba classic film which I would have watched. A lot of Yoruba films rely on proverbs and oral-storytelling of old but I can’t remember the source, now. Still, another two elements I strongly feel, that might have removed any possibility of a chilling fear could also have been the following: One: With the exception of the illustration, heralding The Shapeshifter of Co Lao – a clearly ghostly drawing, all the rest of the sketches were pleasant and pleasing. Maybe in future, Tutu Dutta could challenge herself to create more frightening images. That would help the ‘ghostly flavour’ of the book by leaps and bounds. Also, in real life, I’ve found with a few good supernatural encounters of my own – incidents that defy logic – that fear pops up suddenly from sideways or behind a person, without warning. It’s almost lawless, there’s never a perfect timing or order. In the Nights of the Dark Moon, where the moon becomes the motivating element for a ghost to appear, after a while, there this a strong chance that this may appear predictable and formulaic with its tidy and orderly protocol. The child might know what to expect in advance, further down the pages and so, both excitement and anticipation, could be sadly curbed. I think that Nights of the Dark Moon would be a wonderful meditation even as parents or grandparents choose to read to a child or to have chats with then, either a 10, 11 or 12 year old. Not as a bedtime read of course, but as something far more ruminative. Where the child could absorb good judgement ie. foresight and understanding, about people in the real world today – both good and bad. Some evil can be eliminated, some others like bullies or thugs – well… it’s best to keep a careful distance. Note: Speaking from my own experience, MPH Bookstores in Malaysia are excellent with international courier deliveries and I have received my book parcels here in Europe in the past, in record time.